WCPE Episode 209 – DC News, Black Panther Variant Giveaway, and More Interviews! – WORST. COMIC. PODCAST. EVER! Home › Podcast Episodes › WCPE Episode 209 – DC News, Black Panther Variant Giveaway, and More Interviews! WCPE Episode 209 – DC News, Black Panther Variant Giveaway, and More Interviews! Another busy week for the Worst. Comic. Podcast. EVER! John is back from his European vacation, so the guys have a lot to catch up on over the last two weeks. Things have been busy at DC Comics in the last week. A tease over the weekend hinted at comic books being part of the DC Universe streaming service, which has the guys ready to get out their wallets. And earlier this week, Geoff Johns stepped down (or was forced out) as DC’s Chief Creative Officer, only to be replaced by DC Co-Publisher Jim Lee. Listen in to get our take on the news items. Next, Cullen visited Comic Cave PDX over the weekend, where he met artist Tom Beland. Tom has done the spectacular art of the Black Panther #1 variant coming out next month. He was signing advance copies of the book, and even did a quick interview with Cullen to discuss this once-in-a-lifetime opportunity. Cullen did get a copy of the Black Panther #1 variant, signed by Tom, and we are going to pass it along to one of you! 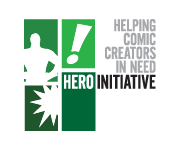 To be entered into the drawing, you need to make a $5 minimum donation to the Hero Initiative. Send us proof of your donation by next Wednesday, June 20, 2018, to worstcomicpodcastever at gmail dot com to be entered. One lucky person will have the book sent to them, well before the actual release of the title. Cullen has two additional interviews that he conducted at the Image Expo earlier this spring. First is a conversation with creator Farel Dalrymple, whose new book is Proxima Centauri. Next is an interview with Jody Leheup and Nathan Fox for The Weatherman. Both of those titles are hitting the shelves soon!